Advantages: Well thought out format; concise descriptions of each subject; excellent colour profiles; interesting selection of close-up “walk around” photographs. Conclusion: If you plan on building a collection of Me 262 subjects or just want a clearer understanding of the variants, then this publication is exactly what you need. Many modellers build on a theme. They pick a subject and then assemble a collection based on the various design stages of the aircraft. Often the collection will start with the prototype, and pre-production airframes. It then leads to the operational aircraft and frequently results in the addition of different versions. This book will allow you to follow such a concept. 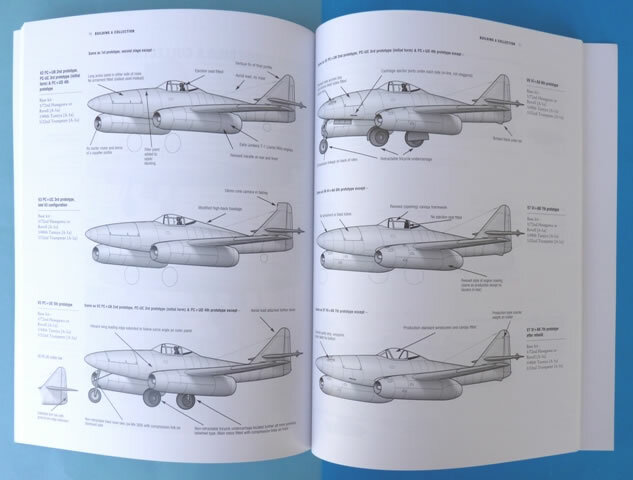 Contained within the soft card covers are 110 A4 sized pages that cover everything a modeller needs to know about the subject aircraft. 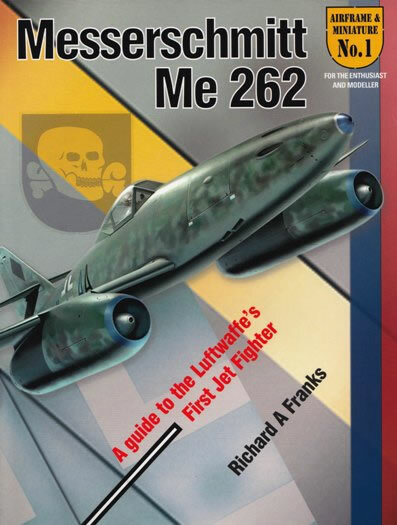 In this case the subject is the Messerschmitt 262, a design that was to become the World’s first operational jet fighter. The format has been well thought out, with the book essentially being divided into two parts. The first describes the aircraft itself and the second is the domain of the modeller. Between the soft card covers are 112 pages of text, photographs and illustrations. The A4 size of the publication allows each image to be reproduced to good proportions without running the risk of cluttering up the page. 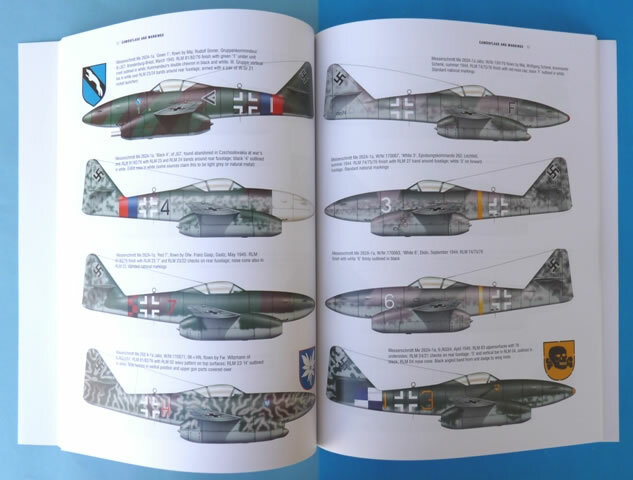 The author starts with the evolution of the Me262 and as such the reader is introduced to the prototype and pre-production machines. 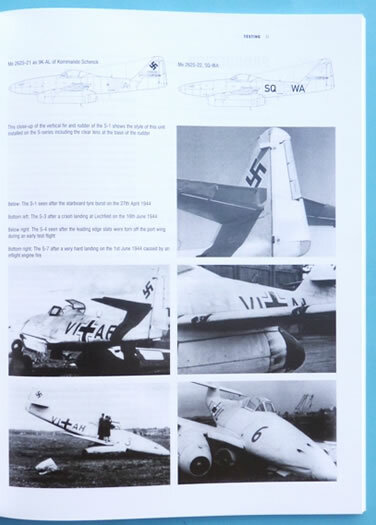 Each aircraft of the Versuch (V) series is discussed separately and carries a detailed synopsis of the airframes’ history, its details, and the colours and markings it wore. This same level of detail is carried over to those subsequent aircraft with the “S” designation. The main production variants follow with the “A” series taking the spotlight in chapter 3. Next are the two-seaters and then the various drawing board projects. Line illustrations provide an additional visual aid as do the accompanying period photographs. The camouflage and markings of these jets continues to fascinate modellers. Understandably, a whole section is devoted to this subject and it comes complete with 28 colour profiles. These are superbly done with schemes covering both day and night fighters, “bombers”, and even a few post-war examples. So how do the kits compare against the available data? Richard Franks examines this question by building and critiquing a wide range of models in 1:72, 1:48, and 1:32 scales. 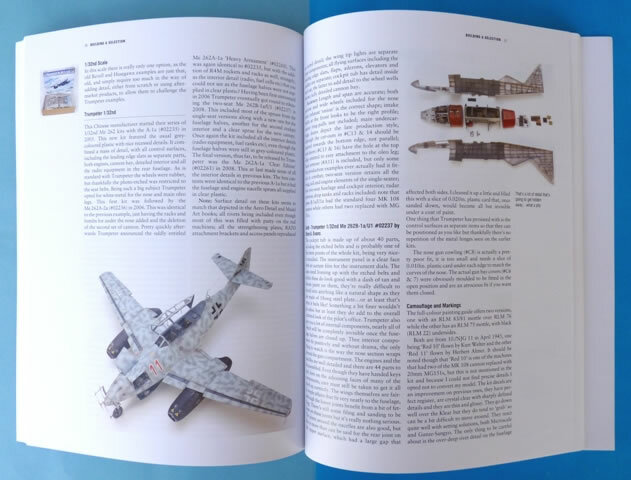 To assist in building a collection of the main Me262 variants, a chapter is devoted to illustrating the external differences and recommending which kits can best portray these options. Rounding out the publication is a compilation of close-up photographs. 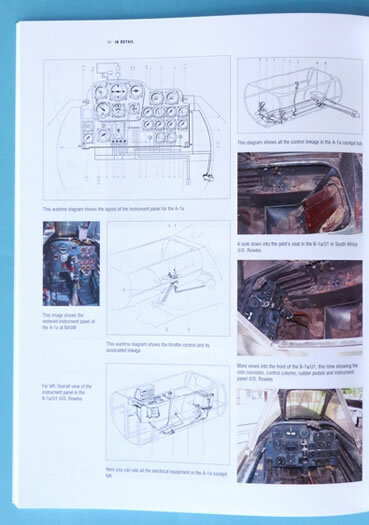 These detailed “walk-around” images look at most facets of the airframe and are supported by diagrams from the original service manuals. Many times a modeller wants to build a series of aircraft but doesn’t have the time or inclination to wade through the masses of reference material generally found in the marketplace. This book allows you to quickly ascertain the differences between each variant and provides you with the necessary information to reproduce them. It’s the first in a series of publications and if they live up to the standards of this one, then we are in for a treat.